Delhi University’s business enthusiasts headed to SRCC on Valentine’s Day, get your mind out of the gutter because it was for Biz Street the Commerce Society’s annual departmental fest. As soon as one entered the college premises one was greeted with a rather innovatively done up notice board about Biz Street; innovative because the words Biz Street were put up on it with fake as in game currency notes. The highlights of the day included the Business Quiz- Cognizant, Mock Stock- Arbitrage (finals) and Ambush Marketing. Cognizant, the Business Quiz was an event that initially pulled in a large crowd but as the day went on the audience got thinned down to not more than a dozen students. Unaffected by that, TOI Editor and avid quizzer Mr. Manimugdha Sharma who was the quiz master for the day conducted the quiz in a delightful way. The questions were well thought out, and included audio, logos related, and the conventional type of questions, and were well presented by Mr. Sharma, who said that he was at SRCC on Valentine’s Day only for his first love ie. Quizzing. Out of the 20 questions in the prelims round 6 teams were chosen to take part in the finale and being the day of love, one couple team was given direct, wild card entry into the finale- making it a total of 7 teams battling it out. The finals had questions on various themes, few generic but mostly business related like, beauty and the beast, economics of love etc. The finals of arbitrage, the Mock Stock event mostly saw participants bent over their calculators and rough sheets, rattling their brains at the situations thrown at them by the chair. Ambush Marketing, an event that had huge potential of pulling crowds did do that, but for the wrong reasons. Participants in pairs were given 2 rival brands to market and most of the students only ended up making a mockery out of it. 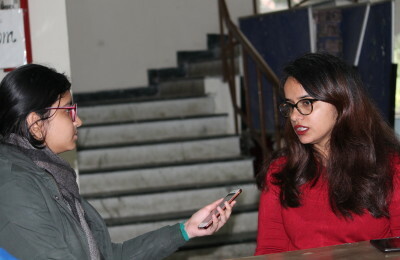 “We did not expect students of mostly commerce colleges to take such a ridiculous approach to this competition, which could have been rather informative,” said Aditi Rathi an audience member and SRCC student. Participants simply rambled on, did not bring any valid points to the table and only got the crowd to hoot for them. All in all Biz Street did manage to pull in a decent footfall, what is commendable is the effort of the organisers and volunteers that did show up in most events.